The best place to start your hair transplant investigation is right here! We are usually able to review your submission and provide an assessment within 3 business days. Click ‘Start Your Online Consultation‘ to send us your contact information, transplant history and pictures of your hair loss and donor area. If you’re in Vancouver, we’re happy to meet you in person to evaluate your particular needs. Drop us a line using the contact form below or call us at 604-739-4247. View our interactive gallery of before and after pictures. 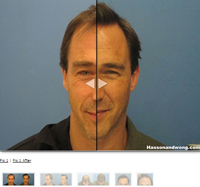 See HD before and after videos at hassonandwong.com. Check out our latest videos on our YouTube Channel. See hundreds of unretouched photos and HD videos of Hasson and Wong’s real patients and authentic transplant results. We guarantee all photos and videos on our sites are our own authentic patients and the results are never photoshopped. © Copyright - Hasson & Wong.